Please save the date for CLC’s 20th Anniversary Celebration. This event will take place during the 20th Summer Camp on Thursday, July 26th, 2018 from 5:00 – 7:00 pm. The party will be held on the campus of Aquinas College at the John F. Donnelly Center at 1700 Fulton St E, Grand Rapids, MI 49506. 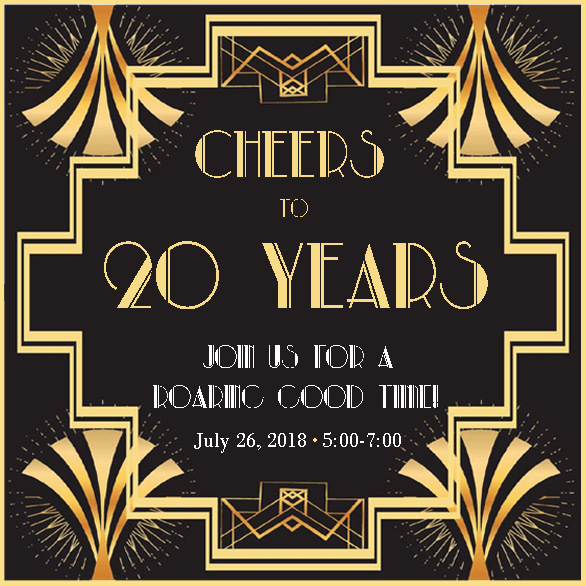 It is sure to be a “Roaring Good Time.” Bring your best 20s attire and join us for a glamourous evening of music, dancing, food, and fun. We look forward to celebrating with all of our current and past CLC families, supporters, community partners, and friends. Please RSVP to Katy by calling the office at 616-575-0575 or emailing kchapman@conductivelearningcenter.org.